[PDF] Thermodynamics: Theory & Practice: The science of energy and power. | Free eBooks Download - EBOOKEE! 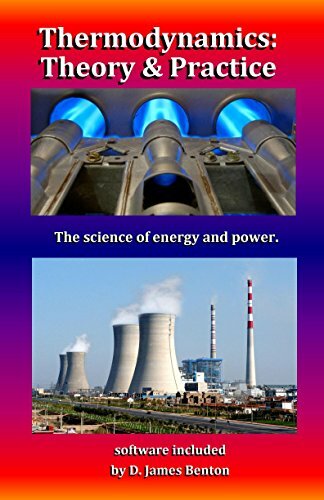 [PDF] Thermodynamics: Theory & Practice: The science of energy and power. Description: Thermodynamics is the branch of physical science that deals with energy in its various forms, including heat and work. Energy is a property of systems that can be stored and transferred to other systems. Energy is not the "ability to perform work." This is a misnomer. A system may contain considerable energy without having the capacity to perform any work. Thermodynamics is the key to understanding how things work. In this text we will explore classical (or macroscopic) as well as statistical (microscopic) thermodynamics, properties, processes, and heat engines. A variety of applications will be presented and all software is included. This book is not intended to be a textbook on thermodynamics or to replace any of the excellent textbooks that are already available. I hope you will find this to be a helpful companion to such texts. I cover several topics (e.g., microscopic point of view, speed distributions, and probability) that are never covered in textbooks on classical (i.e., macroscopic) thermodynamics and are often reserved for graduate courses. I consider these topics to be essential to understanding the whole of thermodynamics and many practical applications in particular. I hope this presentation will inspire you to dig deeper into this fascinating field. No comments for "[PDF] Thermodynamics: Theory & Practice: The science of energy and power. ".